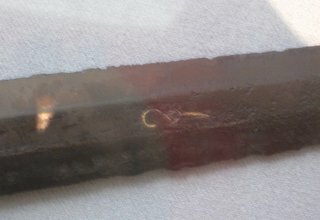 I recently made a visit to the Metropolitan Museum in New York and thought I would share some photos of five swords that are newly on display, all are on loan to the museum as of last year. 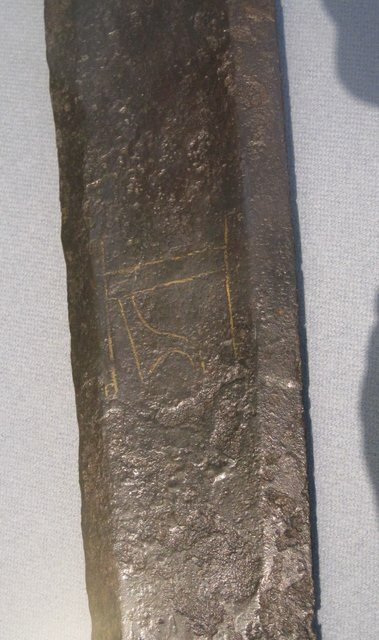 1) A Petersen type-V with traces of an inscription. 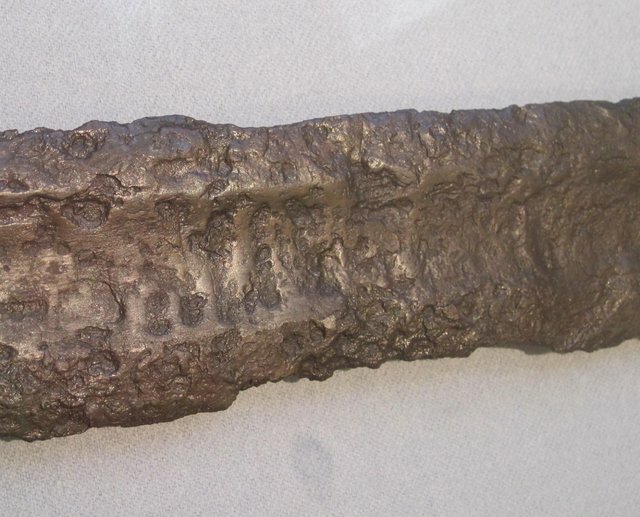 2) An earlier sword, possibly c. 800. 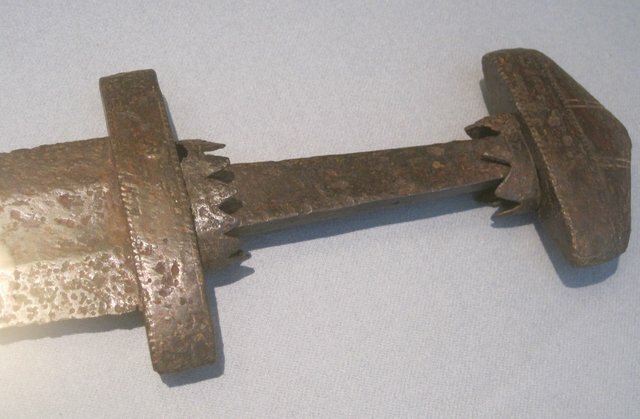 Petersen's special type 6 - possibly a precursor of type K, with the pommel not yet divided into lobes. Inlaid with indistinct letters of patterns. 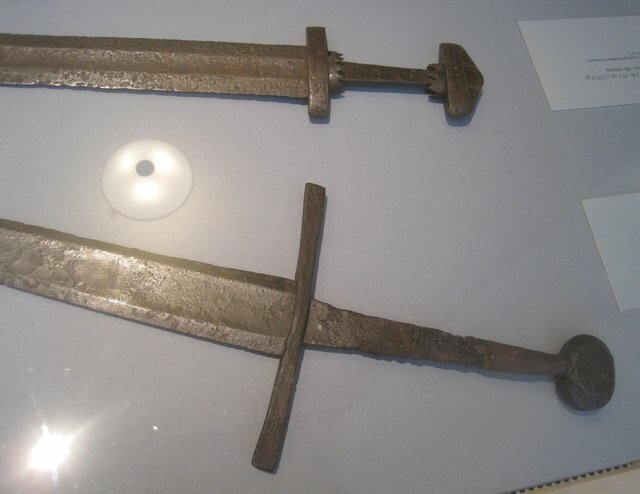 Has been discussed previously: see second link for posts from the finder of the sword in 2002. 3) An XIIIa(?) with a very broad fuller. Inlaid with a single character in yellow metal. 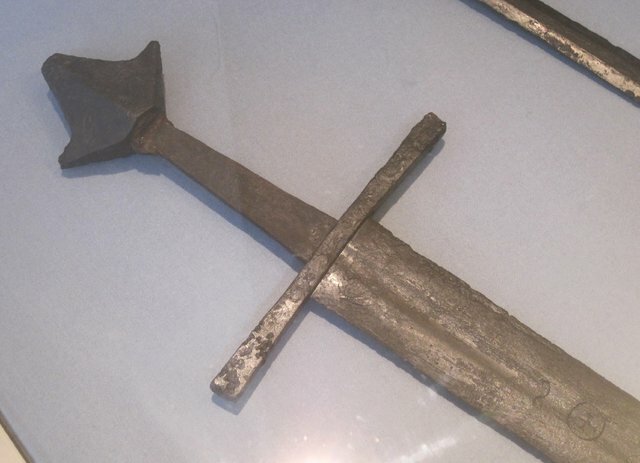 4) Oakeshott's XVII.2 in Records of the Medieval Sword. Formerly in the E. A. Christensen collection, sold at auction in 2012. 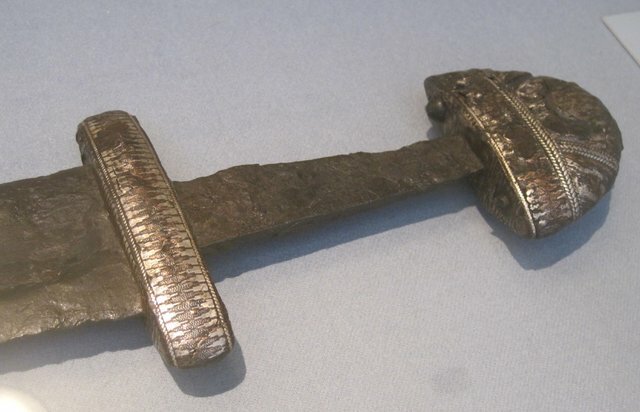 5) A sword with a very distinctive pommel, perhaps type XII(? 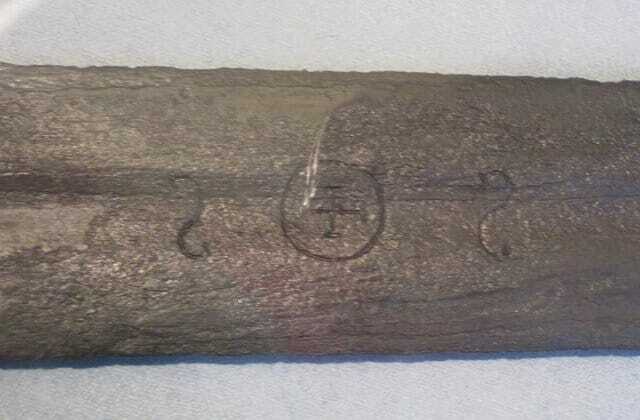 ), inscribed with the letters S O S. Appears to be the same sword sold by Hermann Historica. 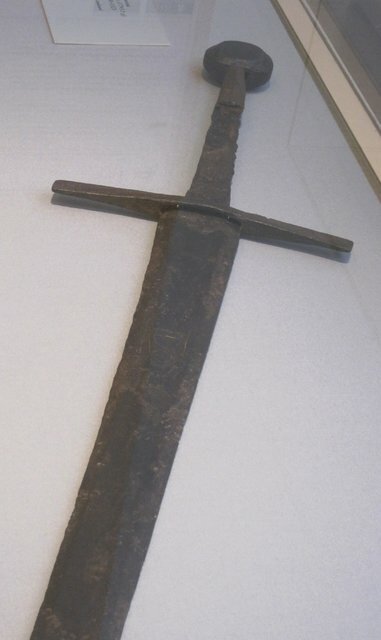 By the way the Christensen sword (Oakeshott's XVII.2) we also discussed in this thread about the Boringholm sword. So great to see your even more detailed pictures. 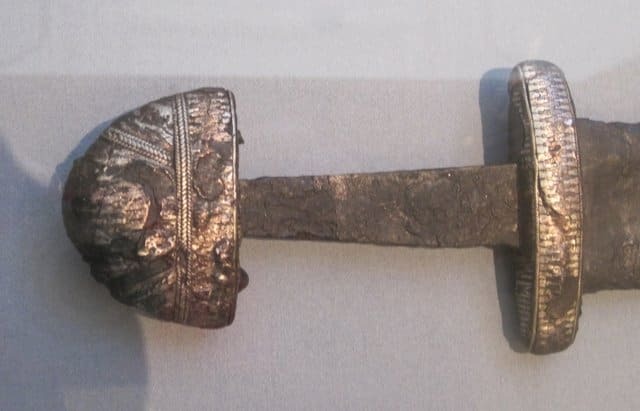 Two things catch my eye in this group; the XII with the odd pommel (seen this one before) and the XIIIa with the broad fuller. Is that fuller short like an XIII or long like an X? Hard to tell in the pictures...looks short in one and longer in another. Is that fuller short like an XIII or long like an X? Hard to tell in the pictures...looks short in one and longer in another. The fuller is short, the photo of the tip is misleading... what looks like a fuller is actually flat, the cross-section must be quite hexagonal. Conditions were not so good for photography, and I didn't get a photo that shows this more clearly unfortunately. 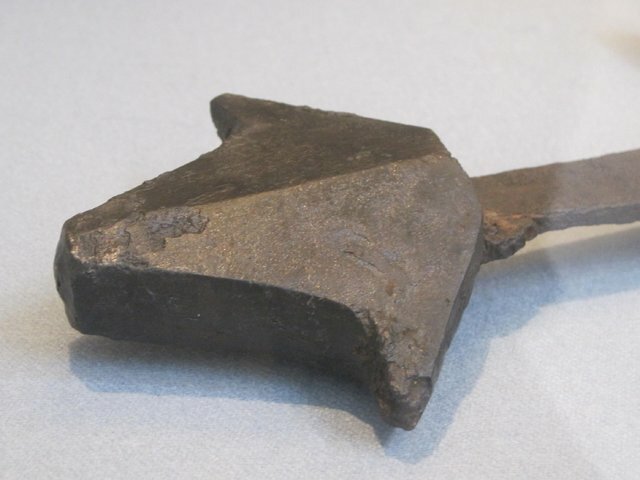 The museum label gives the weight as 1743 g (about 3 lb, 13 oz. ), total length was... probably 120 cm or so?
" The museum now gives the weight as 1392 g, only an ounce over three pounds. So that's confusing..". Not really, for all his knowledge and enthusiasm Oakeshott was notoriously careless when giving dimensions and weights of swords. It seems he frequently quoted these from memory, often long after examining the sword, with the results we now have to deal with. So where there's a discrepancy I would suggest go by the museum figures (though even these are not always 100% accurate). I certainly agree on the comments regarding Oakeshott's measurements! 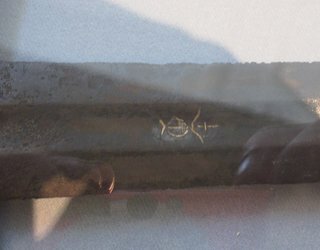 I've been conducting a survey (for a future article) on the various measurements of medieval swords with the Type XVII bladeform, and have fifteen examples for which the weight of each piece is known. 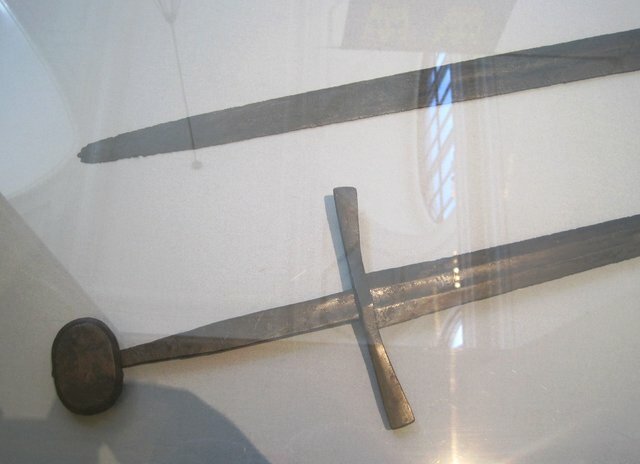 The examples have total lengths of between 75.5cm (29 3/4 inches) - Wallace Collection A.461, and 136cm (53 9/16 inches) - Museum of London 39.142. 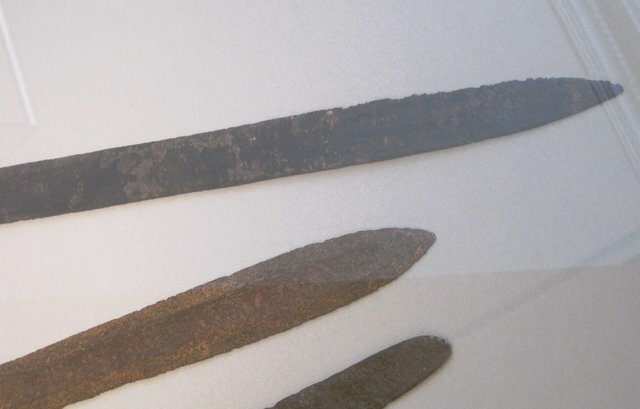 Within this group, the average weight is just 1,362g (3lbs 0oz), with only the larger specimens (120cm-plus, with broader or thicker blades) weighing anything like the 4-5 lbs that Oakeshott suggested for this type. The heaviest on my list is in the Deutsches Historisches Museum, Berlin (No. 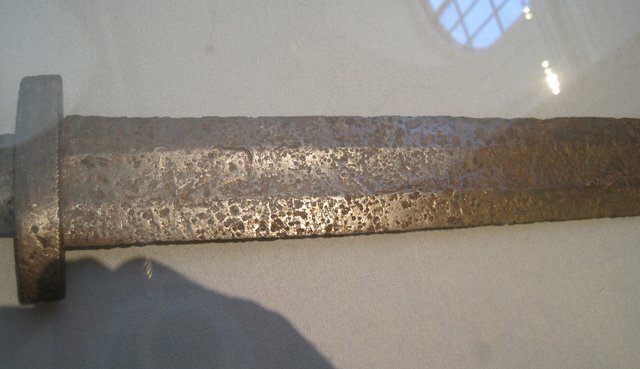 W.893), which measures at 2,190g (4lbs 13oz) with a length of 135.5cm.